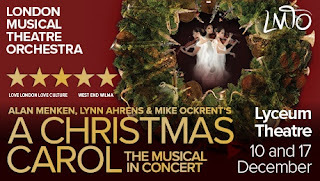 Musical Theatre News: London Musical Theatre Orchestra's A Christmas Carol in concert back at Lyceum this year. 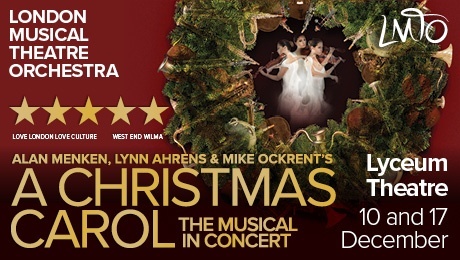 London Musical Theatre Orchestra's A Christmas Carol in concert back at Lyceum this year. With an all-star cast soon to be announced, and the 32-piece London Musical Theatre Orchestra in full festive swing the Charles Dickens' classic tale gets the full Broadway treatment by the award-winning team of Alan Menken (Beauty and the Beast, The Little Mermaid, Aladdin), Lynn Ahrens (Ragtime, Seussical) and Mike Ockrent (Crazy For You, Me and My Girl). This joyous tale ran for ten years at New York's Madison Square Garden, where The New York Times called it "a tonic for adults, and for children a transfixing journey".